Why Rhizoctonia is becoming a problem? 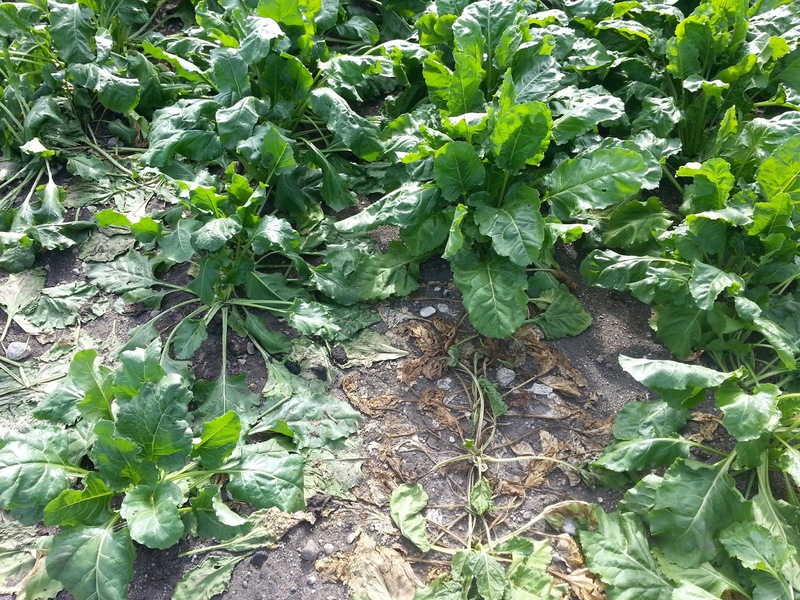 Rhizoctonia can kill sugarbeet seedlings before or after emergence and adult plants during the growing season, depending on the soil moisture levels. Rhizoctonia can survive as dormant sclerotia in the soil for at least 2 years, when you have previously infected-roots that are buried in the soil. For some of you who are only doing 2-year rotation for beets, the risk of Rhizoctonia development is much higher compared to 3- or 4-year rotations. If you have shorter rotations and/or susceptible host crops in the rotation, the risk will be much higher. What can I do about seedling Rhizoctonia? Rhizoctonia damage at seedling stage can be seen as uneven stands in parts of the fields and dark lesions can be observed on the wilting seedlings at or below the soil line (Figure 1). Since 2017 all the sugarbeet seed sold in MN and ND comes with some sort of fungicide as a seed treatment. These include Kabina, Systiva, Vibrance , and Metlock Suite, individually or in combinations. Any of these seed treatments are effective in protecting the seedlings for up to 4-5 weeks and any activity afterwards will depend on factors such as soil conditions and microbial activity. Figure 1. Rhizoctonia damage on the seedlings at the soil line. How can I manage Rhizoctonia during the season? Typical collapse of crowns (Figure 2, Top) or ladder like pattern of lesions (Figure 2, bottom) can be observed on the roots of wilting plants, which are indications of Rhizoctonia infection. Most of the growers are applying a POST fungicide when the 4 in. soil temperatures are at 62 - 65 F, but it can be challenging if you cannot get in to the fields, especially if they are wet. As seed treatments are offering early protection, you have some window of time to apply these POST fungicides at 4- to 8-leaf stage (ideal at 6-leaf) depending on your convenience and other factors. Fungicides such as Quadris, Azteroid or other generic formulations of Quadris, Priaxor or Proline can be used for POST application. Figure 2. Rhizoctonia damage leading to collapse of crowns (top) or ladder like pattern of lesions (bottom) on the roots. How can I apply POST fungicides? Fungicides applied as a 7 inch band over the plants, to cover the crown area and some soil surrounding the crown area, should work very well. We also looked at broadcasting Quadris in 2016 and 2017, where efficacy was comparable to band application. However, broadcasting should only be considered as a second choice compared to band application. It may be beneficial to time the POST application prior to a rainfall (about ½ inch) event so that the fungicide can be re-distributed in the root zone. What about the root rot occurring at the tip of the roots? We are also seeing some fields where root rot is only occurring at the tip of the root (Figure 3) at or below 4 inches from the soil line. 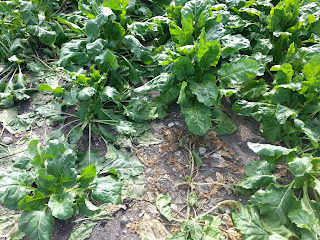 This can be a challenge for some growers as we don’t know if the POST fungicides can go that deep to offer protection. One way that my work very well for these fields is by applying fungicides in the furrow at the time of planting sugarbeets. Based on previous research done at the University of Minnesota- Northwest Research and Outreach Center in Crookston, Quadris applied in-furrow offered protection up to 8 weeks after planting. The key here is to keep the beets as healthy as possible during the season so that they are able to withstand some late season infections, if there are any. Fungicides such as Quadris, Azteroid or other generic formulations of Quadris, Headline, and Xanthion can be used for in-furrow application. Caution: There is a risk of injury to sugarbeet seedlings from fungicides applied in-furrow if there is an extended period of cold weather immediately after planting. The risk will be even higher when in-furrow fungicide is mixed with a starter fertilizer. The risk is higher in lighter (sandy) soils with low organic matter. Please check the fungicide label for any important information with regards to in-furrow application. Figure 3. Rhizoctonia Rot observed on the tip of the roots (top and bottom). What about my management plan if I am using a Rhizoctonia specialty (tolerant) variety? The specialty varieties that are available in the market still need to reach 4 to 6 leaf stage before the natural plant resistance will be active, so you have to protect these plants until that stage. Rhizoctonia being a soilborne pathogen can move with your farm machinery into clean fields. As a best management practice, you should pressure wash your farm machinery after using in the Rhizoctonia fields. If you are not sure about how to proceed, below is a comprehensive management plan for Rhizoctonia that should work for most of you. As always, there will be exceptions, and I will be happy to assist you in finding the most appropriate way for you. You can answer the questions in columns 1 and 2 and see which options work best in columns 3 and 4. Seed treatment is not listed as an option here because every sugarbeet seed has a Rhizoctonia treatment in 2018. Our Sugarbeet Pathology Lab in Crooskton will be offering diagnostic services for sugarbeet root diseases again in 2018. If you are not sure about the problem, please send in your plant samples (without soil especially for samples out of MN), we can help you to find out what is causing the problem. Alternatively, you can also request your agriculturists to pull samples for diagnosis; they are very familiar with our service. For a detailed comparison of fungicides that are commonly used for managing Rhizoctonia and other management options including diseases caused by Aphanomyces, I highly encourage you to see this presentation and publications from 2018. Mention of trade names or commercial products in this article is solely for the purpose of providing information and does not imply endorsement.